The intensity and the direction of the movement of USD. The intensity and the direction of the movement of GBP. 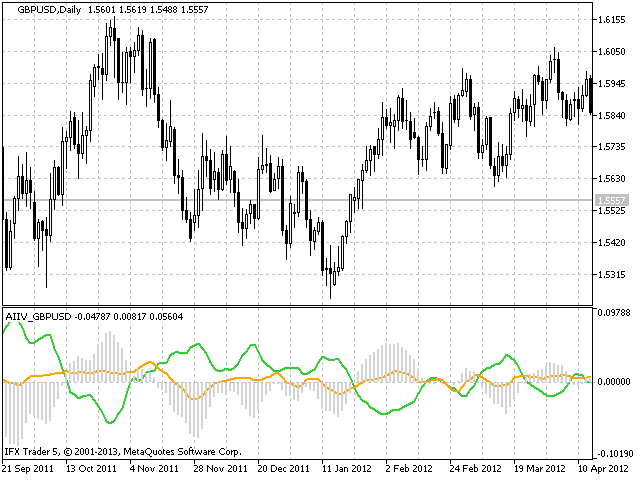 The inflection value of GBPUSD. This indicator allows determining a state of inflection on the market with a delay of one-two candlesticks and a 60% precision (precision depends on the chart timeframe - the higher the timeframe, the more precise is the forecast). AIIV is a series of indicators of inflection values. Other popular currency pairs are planned to be covered in further developments that will be published in my products. 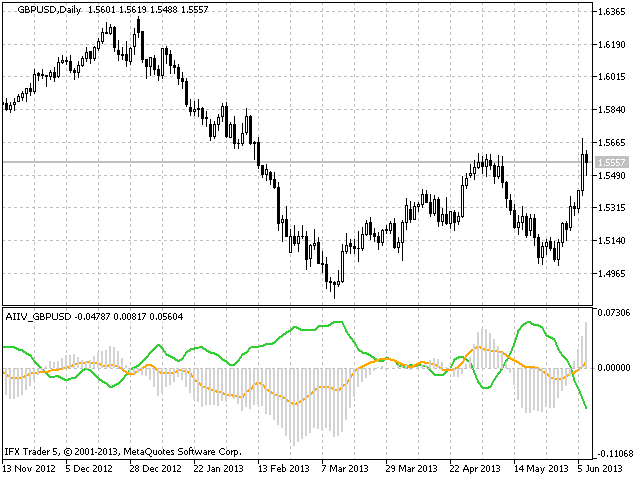 There you can also find two free versions - AIIV USD and AIIV EUR; they are parts of this indicator. There is also a paid version for the most popular currency pair AIIV EURUSD. 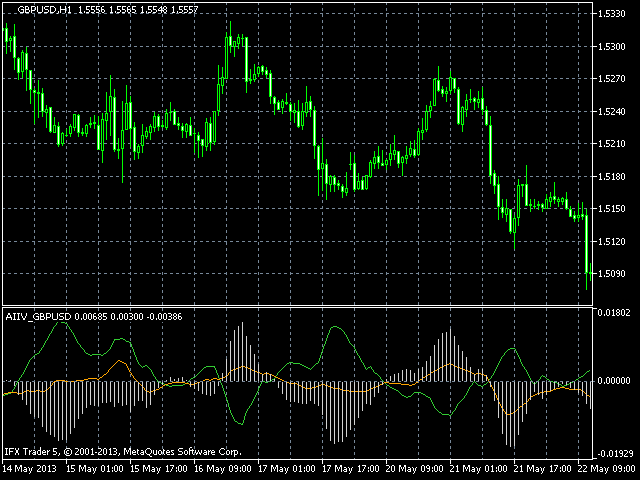 The indicator works correctly on condition that the data for the following instruments is available: GBPUSD, EURUSD, USDJPY, USDCHF, USDCAD, AUDUSD, NZDUSD, EURGBP, GBPJPY, GBPAUD, GBPCAD, GBPNZD, GBPCHF. The indicator redraws with every tick. 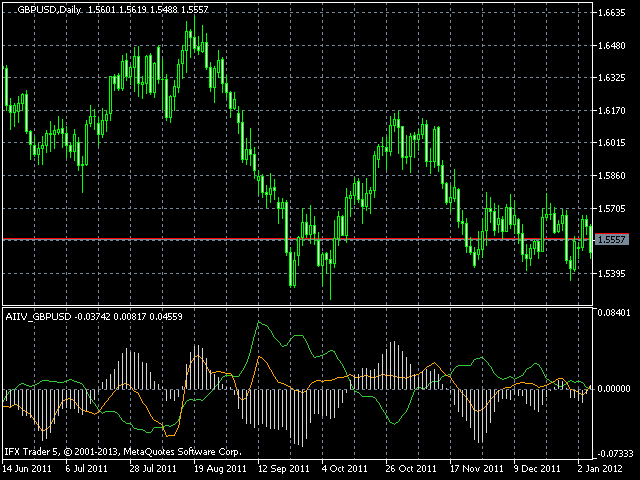 There may be a lag of one-three ticks considering the presence of data for the currency pairs. The indicator draws two lines and one histogram. 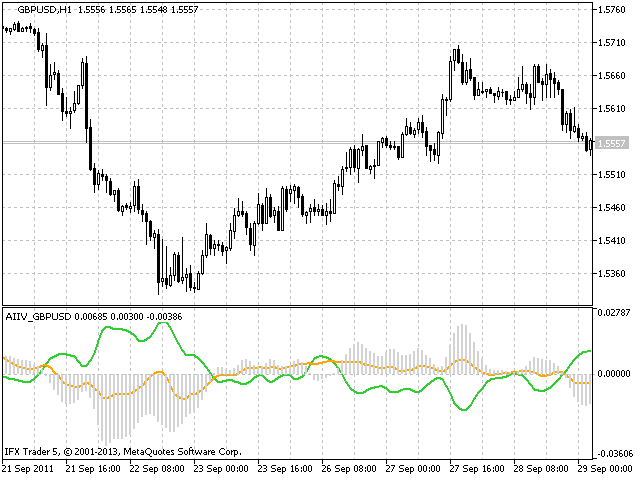 On default, the green line displays the direction and intensity of the movement of USD, and the orange line - GBP. The histogram shows the total movement of the whole pair. If it starts to fall or grow, then the pair changes the direction of movement. Level passivity 1 - the first level of passivity of drawing (usually it is less than or equal to Level passivity 2). Level passivity 2 - the second level of passivity of drawing (usually it is greater than or equal to Level passivity 1). Minimum data to draw - the minimum amount of data by pairs for drawing.